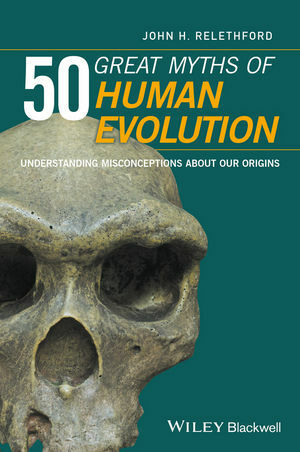 50 Great Myths of Human Evolution uses common misconceptions to explore basic theory and research in human evolution and strengthen critical thinking skills for lay readers and students. John H. Relethford is Distinguished Teaching Professor in the Department of Anthropology at the State University of New York College at Oneonta, USA, where he has taught since 1981. He is a biological anthropologist specializing in human population genetics, human variation, and the evolution of modern humans. He is a former President and Vice-President of the American Association of Physical Anthropologists, former Vice President and President of the American Association of Anthropological Genetics, and a Fellow and Former Chair of Section H (Anthropology) of the American Association for the Advancement of Science. He has over 170 publications, including several books, over 80 peer-reviewed journal articles, and over 25 book chapters. Most recently, he is the author of The Human Species: An Introduction to Biological Anthropology (9th edition, 2013), Human Population Genetics (Wiley-Blackwell, 2012), and co-author of Human Biological Variation (2nd edition, 2011).